Niratama ('ニラ玉', is classified into stir frying), is known as Egg with Garlic Chives in English, and 韭菜炒蛋 (Jiǔcài chǎo dàn) in Chinese. 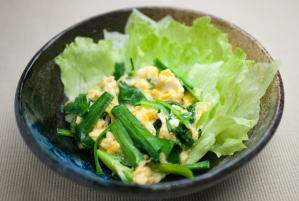 Nira Tamago, Garlic Chive Omelette, Scrambled Eggs with Leeks. Salt, Oil, Pepper, Egg, Garlic Chives, Soy Sauce. Chicken, Sugar, Oyster Sauce, Garlic.